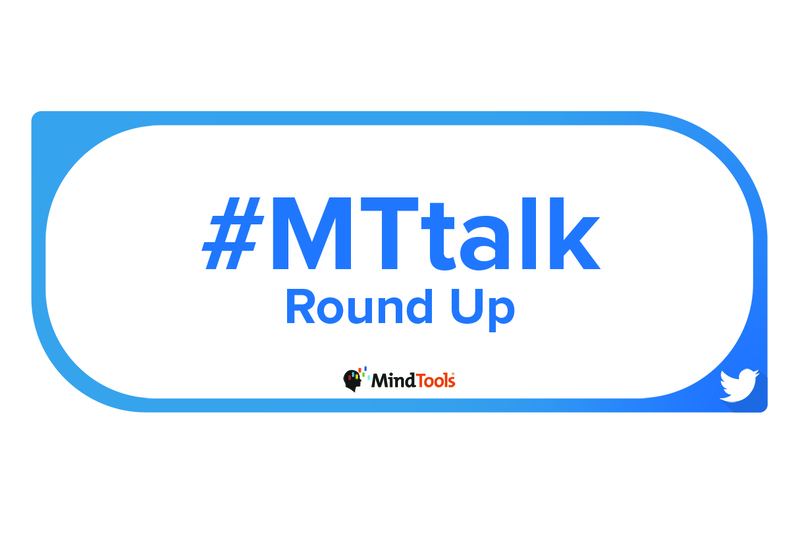 In last Friday’s #MTtalk Twitter chat, we learned that experience is a powerful teacher. And, while experience is not the only way to learn, the lessons that we learn in this way often have the greatest impact. Some common themes emerged from the discussion. We found that it’s important to take the time to reflect on our experiences, if we are to learn from them; that we learn as much from negative experiences as we do from positive ones; and that a supportive environment, as well as the right resources and opportunities, are necessary for personal growth. Many of our participants agreed that learning from experience is the best way to learn, and that it is often more powerful than observing others or learning the theory from a book. But some also pointed out that we all have different learning preferences, and that we learn in different ways. Q1. Is learning from experience the best way to learn? @ClkContrl In most cases, yes! It’s the most natural way to learn. Obviously we can learn from others’ experiences, but it might never have the same impact. @carriemaslen Lessons learned from firsthand experience tend to stick with us. @TheCraigKaye Experiential learning is very important, but so are resources, support, and a protected environment where we can reflect on this experience, such as keep-in-touch meetings, supervision, and peer support. Q2. Is there anything that can only be learned from experience? @upasana_arora4 One example is parenting. It has to be experienced, and no theoretical knowledge can give you the patience to deal with a child. @LernChance Yes! Riding a bike. Try to explain that to a kid. Or falling in love. You have to experience this. @WonderPix It also depends how we define “experience.” Sometimes we re-learn when we re-experience things. Q3. Why is learning from experience so powerful? @MicheleDD_MT Learning from experience is embedded in reality. There are consequences (good and bad) to the choices and decisions made. The learning comes from the lesson we take from the experience, and acting on it. @harrisonia Learning by experience is powerful because it forces our mind to work while engaging the senses. Q4. Which experiences outside of work have contributed most to who you are today? What did you learn? @MarcC_Avgi Growing up on a farm. I learned how to be self-sufficient, the importance and value of hard work, how to look at solutions from different angles, about responsibility, about animals, plants, nature, how to build and fix things, and much more. @BrainBlenderTec Most experiences, because people are put in your path for a reason. Learn from them or forever repeat till you do. Q5. What mistakes at work are you glad you made? @MicheleDD_MT Leaving a job to go to another organization. Despite doing research before accepting the position, the place was toxic. I left and went back to my former company. Lesson: humility and gratitude. @BrainBlenderTec Every single one of them, as it was the mistakes that had the greatest lessons. @Yolande_MT Making mistakes when dealing with people and having a boss who mentored and guided me. It changed my life. Q6. Thinking about your career, which work experiences have shaped you most as a leader? Why? @Yolande_MT Having to manage people with vastly different value sets than mine. It taught me not to be judgmental. @Ganesh_Sabari The freedom to take initiatives, the management tolerating my mistakes, and the learning I derived from those mistakes. @harrisonia I have a healthy understanding and respect for staff at different levels. As a leader, I have not forgotten what it means to work in the trenches. Q7. If we learn from experience, why do we sometimes repeat the same mistakes? @Ganesh_Sabari It may be our ability to forgive, or providing more credit than is deserved. Or, it may be our lack of observation and assimilation. @carriemaslen A key step to learning and growing is to be honestly and brutally self-aware. Q8. How can we learn from experiences at work? What strategies do you use? @MarcC_Avgi I can learn something from each and every experience at work, good or bad. Focus on the things you learned as opposed to dwelling on the bad experience. @harrisonia We can learn from experiences at work by accepting that when others use different processes to reach the same goal, it does not mean they are wrong. @hopegovind Try new ways of doing the work and find out what you learn from them. Work with a new team every time and mix the kind of people. You will see amazing diversity. @llake We have to be mindful that we’re having an experience. Sometimes we are so busy, we don’t slow down to learn and absorb. We learn that we are stronger than we thought and stronger together. Networking and mentoring are great teaching experiences. Q9. How can we support team members so that they get exposure to the experiences that they need to grow? @LifeSpeak One way to support colleagues and expose them to helpful growth opportunities is through mentorship. The process can be highly rewarding and mutually beneficial. @hopegovind Send them for cross-functional experience and send them to a new assignment every time. @BrainBlenderTec Let them make mistakes, but be there to help them up and offer tips that can lead to their decision. Q10. As we start a new year, what experiences from 2018 will inform, inspire or influence you in 2019, and how? @ClkContrl Our team recently doubled and we’re offering new services, so I’m remembering that we are a small business at our core, and we need to use that mindset to our strengths as we continue growing into the new year. @Midgie_MT My greatest achievement in 2018 was the completion of a half Ironman triathlon race (where I came third in my age group!). I will use the same dedication and discipline this year that I used to prepare for my race and apply it to growing my business. @Yolande_MT Once again for me it’s this: love your neighbor as yourself. If only I can get that right, half the battle will be won. Next time on #MTtalk, we’re going to talk about Using Charity to Make a Difference. Which charities do you or your organization support, and why? How do you support them? What kind of a difference does it make to people’s lives? And what benefits do you get from this activity? Read our blog on Tuesday, January 15 to find out more.